The Chargers will wear their 1962 AFL Championship uni’s three times in 2009 in honor of the AFL’s 50th season. The NFL today announced today the entire “Legacy” schedule. The eight original AFL teams will in at least two games wear replicas of their uniforms from the AFL. They will wear the uniforms twice on “Monday Night Football” – in their Sept. 14 season opener at Oakland and Sept. 19 against Denver – and Sept. 25 at Kansas City. 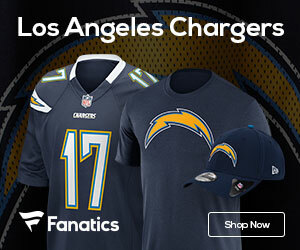 The Chargers also will wear their “alternate” powder blue jerseys for two more yet-to-be-determined home games.